Can’t decide? Try a mix of our 3 most popular meals! 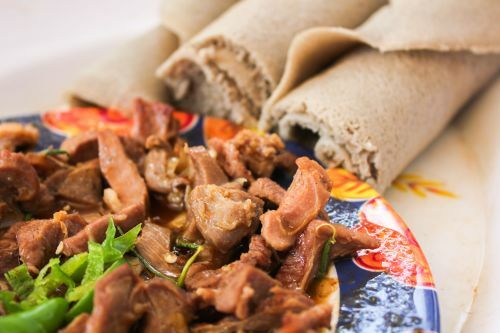 Ethiopia Down Under uses their own specialised couriers to deliver their food. A traditional dish with a chicken drumstick cooked in pepper sauce and served with a hard boiled egg – a spicy hot meal. Pieces of chicken breast fillet pan-fried fresh with chilli, onion, capsicum and tomato. Chicken cooked with carrot, green chilli and onion. Prime lamb pieces, pan-fried fresh with chilli, onion, capsicum and tomato. Prime goat pieces, pan-fried fresh with chilli, onion, capsicum and tomato. Traditional spicy beef in berbere sauce. Chef's special beef in coconut cream sauce. Pieces of Nile Perch fresh water fish fillet (no bones), pan-fried with chilli, onion, capsicum and tomato. Yellow lentils in mild spices. Red lentils cooked in berbere sauce. Spiced potatoes cooked in berbere sauce. Spiced pumpkin cooked in berbere sauce. Spiced zucchini and green beans in a berbere sauce. Kay wat, miser wat and alit’cha yayesh wat. Atkilt, miser and dinich (spiced potato) or dubou (spiced pumpkin) wat. Atkilt, miser and kik wat. Chopped potato, tomato and green chillies in a lemon and oil Ethiopian spiced dressing. Feta cheese, tomato, lettuce, capsicum and onion in a lemon and oil Ethiopian spiced dressing. Tomato, lettuce, onions, capsicum and crispy bread pieces in a lemon and oil Ethiopian spiced dressing. Traditional Ethiopian bread with spicy oil and herbs.